In November 1986 in Chemerikata area near the village of Ravnogor, during a potato sowing, villagers came upon a stone facility that later became known as the biggest domed Thracian tomb in Bulgaria. The discovery of the Ravnogor tomb urged the senior research scientist Georgi Kitov to excavate the site with a team of archeologists in 1987. The tombs date back to the 4th-6th C BC and are 20 in number. An extraordinary discovery was made in the 9th mound – ornamented horse trappings – bridle forehead plate seven round applications. Six of them grouped in pairs (used for cheek plates on both sides of the horse’s head) are depicted busts of the goddesses Athena, Artemis and Nike. Goddess Athena is depicted with helmet, shield and spear. The seventh application (placed on the chest of the horse) is depicted winged Thracian God with a wreath on his head. The objects are of great artistic value, made of silver and covered with gold leaf. 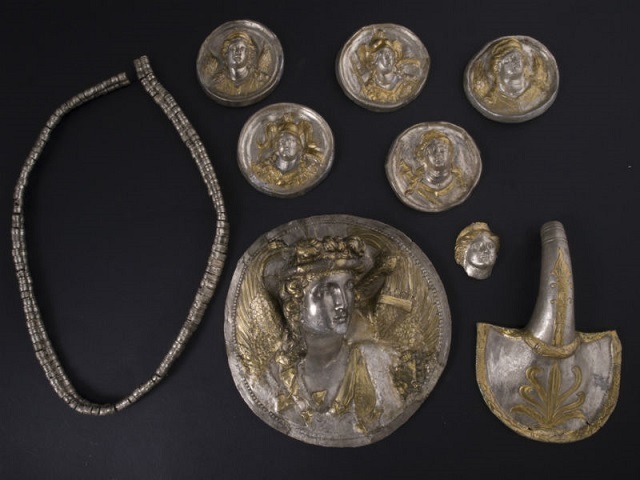 The Ravnogor Thracian Mounds’ Treasure is stored in the Regional Historical Museum of the town of Pazardzhik, (when it’s not on a tour around the world – the treasure is represented in Belgium, Germany, France, Switzerland, USA and Japan). More pictures of the Western Rhodopes you can find here.